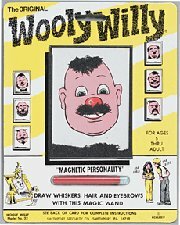 Wooly Willy was originally invented in the 1950’s, but it was in the 1980’s that it started to disappear from our shops. I wouldn’t be surprised if the reason for its phasing out was something to do with health and safety laws, considering that iron filings were one its main constituent parts. It was such a simple toy, yet it provided hours of fun on long car journeys. It comprised a piece of cardboard with the hairless Willy printed on it. Over the top of Willy’s portrait was a piece of clear plastic, which contained a quantity of iron filings. A magnetic tool was provided, which you held underneath the guard in order to move the iron filings about. It was then up to you to create whatever hairstyle, beard or moustache you wanted Willy to have by carefully shuffling the iron filings to the correct place on Willy’s picture. When you were board with your design, you just up-ended the whole thing and could start again. That’s really all there was to it, but somehow it kept you captivated for hours. You could also invent your own games too. For example, you could drag the iron filings into a wiggly maze, then challenge someone else to get a clump of iron filings through without destroying the walls of the maze. It was also fun to watch the way the iron filings stood on end when you put the magnet under them, and generally just dragging them about the cardboard to make different shapes. UPDATE! If you have an iPhone, iPad or iPod touch then why not download our free app FaceMaker – a homage to Wooly Willy! This entry is filed under Toys - Miscellaneous	and was posted on October 5th, 2007. You can follow any responses to this entry through the RSS 2.0 feed. You can leave a response, or trackback from your own site.